I have to admit up front that I bought this book at a second hand book store and it was on the discount table there. It was about birds and it was cheap, so I had to buy it! I've never heard any one recommend this book as a "must-have", but I'd like to highlight a few advantages and disadvantages about this book. 1. It has great photography! Some of the shots are simply amazing and capture the birds in a variety of profiles and life situations. The photography is so good that I consider this more of a coffee table book rather than guidebook or an identification toolbook. Its a large book with a hard cover like coffee table books generally are. Some of the birds it lists and describes don't have a companion photo which disappoints a little. Since I don't consider it a guide book, I'm okay that it doesn't have photos of multiple variations of each species. 2. The book is organized in taxonomic order which is always nice. Some common North American species are missing from its pages and I don't know why. 3. It has range maps with each photographed bird. I love range maps and maps in general. I used to pin up the National Geographic maps on my bedroom walls and ceiling as a boy. My only complaint about the range maps in this book is that they don't show state/province boundaries which are often very helpful. Another pet peeve I just have to get off my chest...I hereby call upon all range map makers to establish a uniform range map color coding system! 4. Each bird has a blocked out section with the scientific name, the size, the habitat, ID info, and comparisons to similar species. This is followed by an encyclopedia style paragraph about the bird including info about nesting and other behaviors. All great info, but not my go-to source for this kind of information. 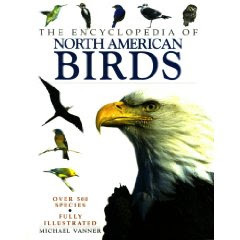 My recommendation: Michael Vanner has put together the perfect book to have around the house for kids to pick up out of curiosity and hopefully prompt a lifetime of interest in birds. Price: new and used online for very low prices.